The 2018 Ford Mustang received its first major makeover since the carmaker brought out an all new version in 2015. With a more aggressive looking grill that features standard LED headlamps and available LED fog lights as well as a more streamlined hood with a new set of vents, this year's Mustang is bound to turn heads. When you take a peek at the back, you'll see updated LED tail lights and a spiffy new rear end. To increase the styling of the 2018 Mustang, Ford added quad exhaust tips to the GT. There's also new paint colors, new stripe options and more wheel choices. For the 2018 Mustang, Ford is offering seven different trim levels that range from the base trim to the GT Premium Convertible. The vehicle model's base level features EcoBoost technology to give you 25 miles per gallon in the category of fuel economy. This model comes with rear-wheel drive, and it has a six-speed manual transmission. It also includes entertainment features like audio controls that are mounted to the steering wheel and a main touchscreen monitor. If you go for one of the Mustang's premium models, then you'll enjoy a more powerful engine, one that will deliver around 19 to 20 miles per gallon when it comes to fuel economy. The vehicle's premium models are also rear-wheel drive, but you can get one that has a 10-speed automatic transmission and overdrive. Ford is offering packages with its Mustangs. Options include the enhanced security package, which comes with an anti-theft system and a wheel locking kit. To upgrade your ride even more, you can request the black accent package. This equips your sports car with ebony black-painted aluminum wheels as well as 19-inch tires. You'll also get a black Decklid spoiler and black pony badges. In the base model Mustang, you'll be driving a 310 horsepower 2.3-liter engine that features 350 pound-feet of torque. 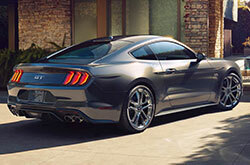 If you upgrade to a Fastback vehicle, then Ford installs a 460 horsepower 5.0-liter engine with 420 pound-feet of torque. Ford got rid of the V-6 engine for its 2018 Mustang, but the car company did upgrade this year's model to deliver more power and better fuel economy. Ford updated the Mustang's six-speed manual in both of the vehicle's engines while the V-8 models received a dual-mass flywheel and a twin-disc clutch to give the car better torque capability. Ford also replaced the six-speed automatic with the 10-speed automatic. The 2018 Ford Mustang hasn't taken its crash tests yet, but it's likely that the coupe and the convertible will maintain similar ratings as last year's model. Both 2017 vehicles received a five-star safety rating from the National Highway Traffic Safety Administration while the Insurance Institute for Highway Safety gave both models a score of "good" for crash tests involving the overlap front and side of the car. Both also received a "good" rating for head restraints and seats. When you go with one of the Mustang's premium models, most of the car company's available safety equipment comes standard. For instance, you'll have eight airbags to keep you safe in the event of a crash. You'll also receive side-impact bars and remote keyless entry. With the 2018 Ford Mustang, the car company is offering safety gear like a lane departure warning system, pedestrian detection and distance alerts. 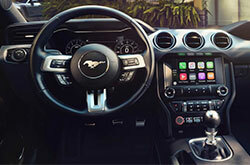 The Mustang can also be equipped with a pre-collision assist system and fixed front head restraints. 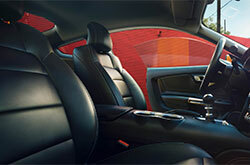 Stop by to learn more about the safety features that Ford is including with its ever-popular sports car.